WHAT TO DO WHEN YOU FIND THE LOVE OF YOUR LIFE AND DRAG IT HOME! Those of you who buy rust free original cars, skip this article. Those of you who own only concours cars, skip this article. 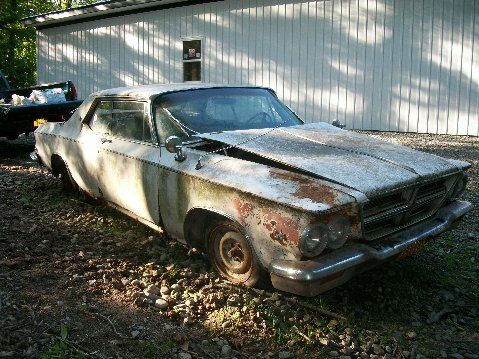 And those of you who buy driveable cars with some rust, skip this article. Those of you that are left have a screw loose. 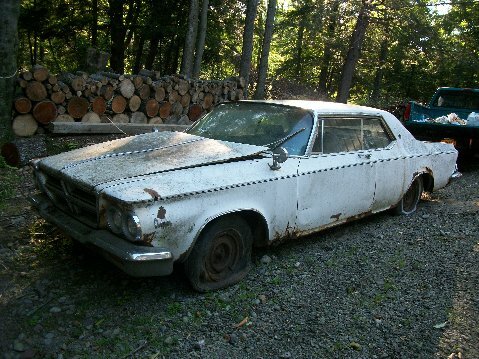 You have also bought a car that everyone things is a rust bucket, beater, lead sled, garbage scow, or junkman special. But through all of its imperfections, you can see what it once was and what it could be if you live long enough. If you have managed to buy the car without strangling the owner for criminal negligence, proceed to step one. Step 1. Remove all animals living and dead in the car BEFORE taking it home. Do this as close to the previous owner’s house as possible. Dead animals are the easiest to remove. It’s the live little critters that are a problem. Bang the doors, hood, and deck lid frequently and with zest. This will have a two-fold effect of scaring the little varmints and removing excess rust. Step 2. Put on the junkyard tires you brought along because they have to be better than what is on the car. 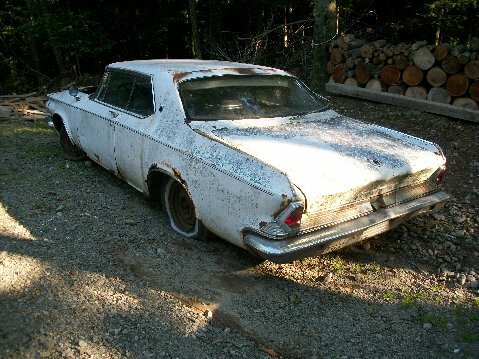 If the previous owner makes any noises suggesting that he may want to help get the albatross out of the yard quickly (usually because the law is on his tail to move it and he has one hour out of the 48 left to do it), hand him the jack and let him jack the car up. This is to allow the car to fall his way, not yours. Does he deserve better? Step 3. Now, hitch it up, wind down the windows and tow it away. Winding down the windows serves to remove excess interior dirt and scare hell out of remaining critters. It also gives them a means of leaving a sinking ship. Keep a sharp eye out for cops. You can get a littering fine. If you have garage space or if you live 20 miles from the nearest neighbor, you can skip this section. This is for the unfortunate who drags the beater home and will have to park it outside until he can figure out where to stash it. Figure at the least, several months of owing the neighborhood eyesore. This section is about how to make the car presentable enough to keep the neighborhood from enacting the local junk ordinance on you. Step 1. When to bring the car home – by day or by night. We leave this choice to you. Bringing the car home by daylight runs the risk of having the neighbors see the car immediately and being able to call the cops right away. However, if you bring the car home at night, when they see it in the morning they will assume it does not belong to you and will be doing you a favor by calling the cops. Step 2. Wash the car. This is the hard part. Use a scrub brush and Ajax first. If this makes no difference to the cleanliness of the car, borrow the biggest super-duper grinder you can find. Fit it with a polishing cloth and use rubbing compound all over the car. Check your medical records first to make sure you have an up-to-date Tetanus shot. Also helpful is to remove large chunks of rust and cut off outstanding rust spears. After the wash, try waxing. I know this is absurd but you want to coax a shine from any part of the car you can. Step 3. Eliminating the Gaping Rust Holes. your car is white, stop there. Just make sure you buy white Bondo. the Bondo any close matching spray. Step 4. Put any wheelcovers you can find on the car. They do not have to match. If you have only 2 wheelcovers, put them on the side facing the street. Step 5. Put license tags on the car. If you do not own an old expired set, you can fake temporary cardboard tags. It does not matter what you put on the car because you know it’s not going anywhere. Step 6. Pretend that the car runs. Do not under any condition try to start the engine. The resulting smoke screen will alert the neighbors that something is amiss. Take empty luggage out to the car and load it. If you have no trunk, use the back seat. Have a friend call you before you “leave”. Then unload the car, sit around looking glum and make loud comments the neighbors can overhear about having to wait for your friend to come over. Do this only once. The impression is set then. Doing this twice may look suspicious. If you have followed Steps 1-6 and your car looks presentable, but the appalling odor is lingering over the neighborhood, move fast to Step 7. Step 7. Removing the Smell. Little critters leave little critter droppings. These do not smell good. First remove the interior. Do this at night so as not to alarm folks. Remove all varmints left in the interior. You may even have to chuck the seats if they were used as bedding. Discard all carpeting and jute. Do not save even for use as a pattern. They will be too rotten to use. Place black tar paper over the windows (to hide your activities), put on a gas mask and by the light of a flashlight, scrape up the residue. Under no circumstances use any type of flame to see by. It may explode when the methane hits it. When finished, place a kitchen chair in the driver’s seat place, drape a seat belt over it and for an extra added touch, place a helmet over the rear view mirror. 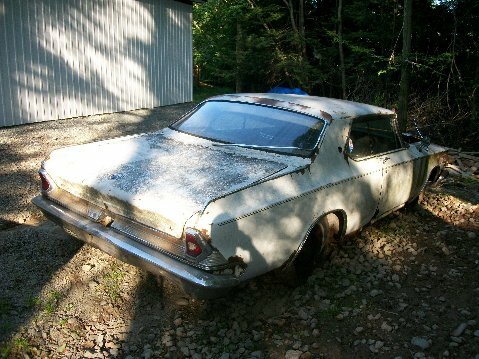 When questioned (and you will be) by nosey neighbors, explain that you decided to restore the car back to original. Only if pressed for further explanation, say that the car was the record holder at the Sands and this was the racing interior. Hopefully this guide will give you enough breathing space to find a place for your precious, and for the parts to restore it. Finding those two items is another story altogether. Now sit back, sip on your beer and kick yourself for buying the thing for too much money in the first place.